Coding is not an easy task as it requires a lot of time to write the code. We have seen various projects abandoned after running for a few years. There are many reasons such as time and money to run the project. However, in the development stage, the code is written and compiled. After the code is written, it is tested to identify bugs and errors. So, the life of the developer is not that much easy. The checking, correcting and analyzing its impact on the visitors are also reviewed regularly. That is why the salary of a developer uses to be higher than other IT related jobs. As a site contains a lot of web apps such as web forms, user registration, and Chat apps. Developing these portion of the website takes sufficient period of time. A very important part of any website is the admin panel where the admins take measures to control the overall running of a website. As there used to be so many coding involved here, it is always a good idea to use already well-coded scripts to save your efforts and time. Quick Working – Due to ready admin panel, it is very easy to run your operations without any hassle. So, your entire focus would be on front-end of the website and visitors’ behavior. Easy to integrate – html5 template admin can easily be integrated with your existing website. So, you will enjoy the same level of experience as you get from in-house admin panel development. Economical – html5 admin template saves you a lot of money. If you have to pay the developer to code for you, he or she could charge the handsome dollar for rendering his or her services. By buying off the shelve package, you will be able to save precious money. This money can be used for other projects. So, this decision can make your project feasible. Bug Free – this html5 Template admin is offered for sale after careful script review and testing. The chances of bugs and error are reduced to a significant level. As a result, you can trust these templates because they are from reliable developers. Sales Analysis – Readymade admin template provides invaluable data/ information to analyze your sales trend. This is very helpful in devising an appropriate marketing strategy keeping in view the available resources. As an owner of a website, you can easily track the status of the sales orders and view profit earned based on a product basis or customer basis. It does provide a yardstick that can enable you to judge the effectiveness of your implemented marketing strategy. Discussion – Admin template allows easy communication and meeting within different admins and moderators. This helps the team in the plan for the future and be aware of the changes that is implemented. This is very crucial to bring all stakeholders on the same pitch to avoid confusion and disputes. Otherwise, the visitors of the website may get confused, that is assumed to be very detrimental for the success of the website. 1.CoPilot – as the name suggests, this admin template works like a pilot of an airplane. It can take off your business in the sky. Forked with AdminLTE, it is a fully responsive admin template. UI has been built with Bootstrap 3 framework. It supports all browsers such as IE, Google Chrome, Firefox, Opera and Safari. Due to highly responsive layout, it fits perfectly on small mobile phones, tabs and computer screens. Within the CoPilot, the developer has included only popular plugins. However, you can add your favorite plugin from the admin panel itself. This template is a full-featured example of leverage Vue. 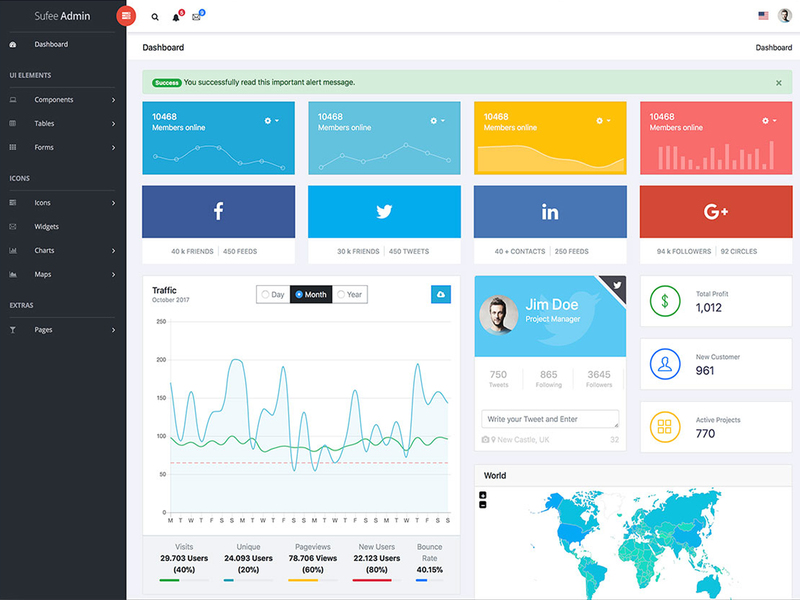 2.CoreUI – it is an open source bootstrap admin template. It is not an ordinary Admin template. Thanks to its clear coding & file structuring, the makes it a number one choice for website owners. As said above, it comes in 6 versions: Angular 2+, Html5 Ajax, .Net Core 2, Vue.js, Html5 and React.js. Actually, the developer of this admin template has the intention to make this a real game changer. In its objective, he has achieved significant success. Every effort has been planted to make sure code is made redundant free. This is the main reason for its lightweight. If you want to customize your website, you can easily do this via CoreUI API layout. The documentation is very detailed and user-oriented. That makes it very simple to have a website of exactly your choice. The dashboard offers unique graphical information. This makes the analysis very easy to understand. Colorful panel due to CSS3 usage makes this template very best option for any type of website. The admin panel of your website is the most crucial section. You may not afford to sacrifice its privacy, security, and integrity. Your admin panel may have information for your valued customer as well. Being the guardian of your customer’s information, it is your responsibility to choose the right html5 template admin to gain new steps of success.